Postpartum preeclampsia is a rare condition in which the woman experiences high blood pressure and high protein urine after childbirth. This condition may develop quickly – in about 2 days after the child has been born. At times, it may take up to 6 weeks to arise. It can be a dangerous condition if not taken care of seriously and even lead to major complications such as seizures and coma. What Are the Symptoms of Postpartum Preeclampsia? If you experience any of these signs after labor, it is recommended that you contact your health care provider immediately. Who Are at Higher Risk of Postpartum Preeclampsia? The condition occurs during pregnancy and is not detected until after delivery. It is strongly believed that postpartum preeclampsia may be a result of a disorder within the lining of the blood vessels during pregnancy that is largely influenced by environmental and genetic factors. The exact cause of the condition is not clear. However, research suggests that some factors may increase the risks of getting the problem. You need to pay special attention if you have the following traits. Some researchers have revealed that postpartum preeclampsia is caused by the change of interaction between placenta and immune system. The lack of immunologic tolerance during pregnancy will lead to hypertension and other symptoms of the condition. 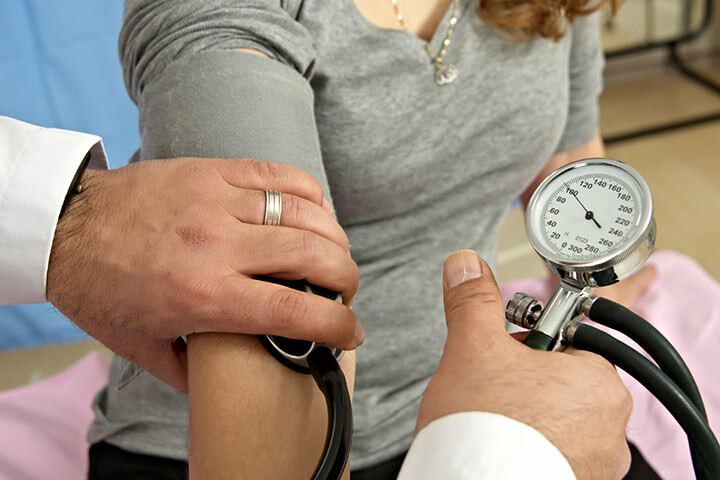 Increased blood pressure during pregnancy may indicate the occurrence of the condition after delivery. Study suggests that pregnant women are much more susceptible to postpartum preeclampsia if the blood pressure increases to a high level at about 20 weeks of pregnancy. Obesity may also increase the chances of developing postpartum preeclampsia. The condition may be developed due to genetic reasons. If any of the close relatives of the woman have previously had postpartum preeclampsia, then there is a good chance that the woman herself may also develop the same condition. Age also plays a role in the occurrence of this condition. The women who are above the age of 40 and who are below the age of 20 have a higher possibility to develop postpartum preeclampsia. Carrying more than one baby at a time may be a blessing, but it may also be problematic. Studies show that women who have twins have had their chances of developing this condition dramatically increase. Are There Any Complications of Postpartum Preeclampsia? Postpartum eclampsia is often associated with seizures and other fatal conditions. It may cause permanent damage to vital parts of the body, such as the brain and heart. It is also known to cause coma, neural degeneration and irreversible vascular damage. The condition can be fatal if it culminates in pulmonary edema. Due to accumulation of fluid from the vessel dilation, the lungs may stop working and thus lead to respiratory failure if not treated in time. In rare cases, a stroke may also occur which is caused by a low or halted supply of oxygen to the brain. You need to seek medical emergency if you experience sudden weakness or numbness which is one of the warning signs of stroke. A blood clot may develop from another part of the body which may travel to the blood vessels and cause blockage. This condition needs to be dealt with promptly to avoid organ failure by the use of blood thinners. Another life-threatening condition, known as HELLP syndrome, may also develop together with postpartum preeclampsia. It is a kind of liver disorder which is dangerous for both the mother and the baby. The first step when you notice the symptoms is to visit your doctor immediately. In order to confirm the diagnosis of the condition, the doctor might request a few tests like blood tests and urinalysis. The blood test will check whether the kidneys and other organs in the body are functioning properly and the urinalysis will see if the urine contains high level of protein. Postpartum preeclampsia is generally treated with medications to lower blood pressure and the ones preventing seizures like magnesium sulfate. Treatment must be taken with care as such medication can cause side effects like skin irritation, nausea and occasional vomiting. It is best to consult a doctor for a proper medication prescription. If you are breastfeeding, do inform the doctor so that he/she can prescribe accordingly. You may need to stay in the hospital for longer time once you've been diagnosed with postpartum preeclampsia due to the physical and mental discomfort you may experience. Also discuss with your doctor about how to safely perform the role of a new mother with the condition.